Canadian researchers have published promising results of the first clinical trial in the world of a genetically-enhanced stem cell therapy for pulmonary arterial hypertension (PAH). This rare and deadly disease mainly affects young women, and is characterized by very high pressure in the arteries supplying blood to the lungs. In some cases, PAH is caused by a defective gene, but in many cases the cause is unknown. Currently available drugs can modestly improve symptoms and exercise capacity (at best), but cannot repair the blood vessel damage to the lungs or cure the disease. The trial, published in Circulation Research, was designed to test the feasibility and side effects of a genetically-enhanced stem cell therapy to repair and regenerate lung blood vessels in PAH. Seven patients underwent a blood cell selection process (apheresis) to harvest a certain population of their white blood cells. These cells were then grown in the laboratory under special conditions to select for stem-like cells called endothelial progenitor cells. These cells were genetically engineered to produce greater amounts of nitric oxide, a natural substance that widens blood vessels and is essential for efficient vascular repair and regeneration. The genetically enhanced cells were then injected directly into the lung circulation of the same patient. Although the study was not designed to rigorously assess benefits of the therapy, the researchers did observe that patients had improved blood flow in the lungs in the days following the therapy, and enhanced ability to exercise and better quality of life for up to six months after the therapy. However, there was no placebo group in this study, so it is impossible to know for sure if the effects observed were due to the cells or to psychological effects. The therapy was generally well-tolerated, however one patient who had very severe and disease and signs of poor prognosis died one day after treatment. This was not unexpected, given the patient’s declining condition prior to treatment. Dr. Stewart is also leading the first clinical trial in the world of a genetically-enhanced stem cell therapy for heart attack. The publication, titled “Endothelial NO-Synthase Gene-Enhanced Progenitor Cell Therapy for Pulmonary Arterial Hypertension: the PHACeT Trial”, was published online in Circulation Research on July 20, 2015. 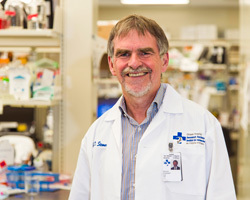 The authors are John Granton (University Health Network, University of Toronto), David Langleben (Jewish General Hospital, McGill University), Michael B. Kutryk (St. Michael’s Hospital, University of Toronto), Nancy Camack (The Ottawa Hospital), Jacques Galipeau (Winship Cancer Institute, Emory University), David W. Courtman (The Ottawa Hospital, University of Ottawa) and Duncan J. Stewart (The Ottawa Hospital, University of Ottawa). The trial recruited patients at St. Michael’s Hospital in Toronto and the Jewish General Hospital in Montreal. It was funded by Northern Therapeutics and the Stem Cell Network.